The Justice Department investigating S.C. police, the Civil Rights Division, the FBI in Columbia, S.C., and the U.S. Attorney’s Office for South Carolina are conducting a civil rights probe into the circumstances surrounding the arrest of the student. The incident in a math classroom involved a white officer and a black female student, who was arrested for disturbing schools, according to the sheriff’s department. Richland County Sheriff Leon Lott, who requested the independent criminal probe, said at a Tuesday news conference he was “shocked and disturbed” by what the short video showed. The deputy involved, who the sheriff’s department identified as Ben Fields, has been suspended without pay. Results from the department’s internal investigation could come as early as Wednesday. Fields, a school resource officer, did not return requests for comment Tuesday. An attorney representing Fields in a separate civil case declined to comment on his behalf. 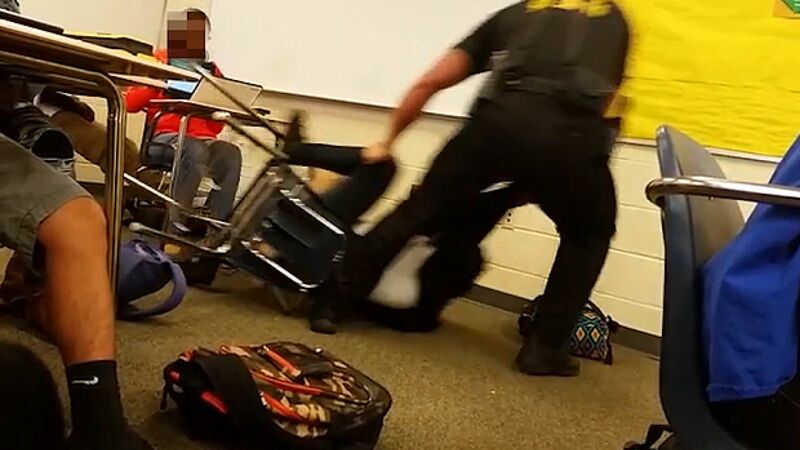 The videos circulating publicly don’t depict the moments leading up to the officer grabbing the student, and school officials declined to provide details, citing the ongoing investigation. The officer involved has been banned from school district property, a “permanent request,” the district’s Board of Trustees Chairman James Manning said at a separate Tuesday news conference.